The premise of Justice League : Dark is very simple both in an conceptual way as well as from a publishing stand point. The thinking going around the board meeting was probably something like this.... "Lets get these popular but underused characters in the DC pantheon and give them some face time and in doing so we can also explore aspects of the DC universe that may be harder to fit into a traditional superhero comic like Batman or Wonder Woman!" 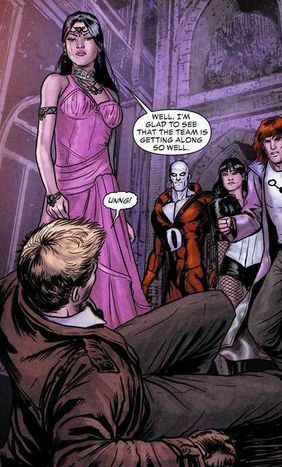 The conceptual idea is demonstrated early on in the book by having Superman, Wonder Woman and Cyborg spectacularly fail at facing a supernatural threat. Demonstrating to the reader that the traditional aspects of the super hero has no sway here, Speed, Strength, being a warrior and so on is not going to help, and just for icing on the point Cyborg is there to show that technology is pretty useless as well. The problem is that the idea of a "Justice League" but one focused on the supernatural isn't exactly a difficult concept to sell. There is strong narrative reasoning for these scenes to be including to demonstrate why a universe like DC would need another "group" but as I was reading I just felt like I was being talked down to a little, spoon fed. It just felt tacked on and forced and honestly a waste of pages. Once the clumsy set up gets out of the way, the story has to go thorough the laborious process of introducing the players. 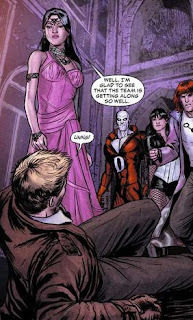 Xanadu, Deadman, Constantine, Shade, Zatanna and Mindwarp as well as a story to connect, bind and focus them. It is an extremely difficulty task for a book of this type. Some characters obviously need more introduction than others and the story becomes crowded and full of exposition. There is a definite sense of orientation here, the book is more concerned with getting everything in place, than actually telling a boss story. This is the biggest failing in the start of this series. The actual story is a mess with a mash of personalities, that the reader may not be failure with leading to confusion and a feeling of pointlessness regarding the action. With out any connection the reader is left looking at a mass of colour where the dialogue has no real meaning. Some of the more famous characters shine through, grasped onto by the reader from the very fact that their personalities are solid and thus give their actions meaning, still for the majority of the cast this is not the case. Once the laborious task of "starting the engine" is done with so to speak the story actually settles down into what is in actuality a pretty cool story. 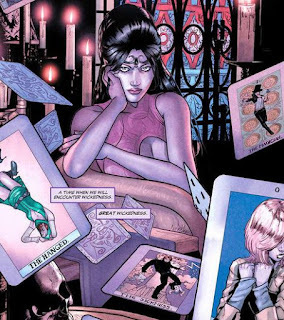 Xanadu and Constantine particularly stand out with a extremely strong character driven conclusion to the tale and a great reveal about why these events happened at all. In fact the final books of this story were so good it really sold me. Making me not so much forget the terrible start but be more forgiving, as it really is a huge ask for a writer to do what has been attempted here. The ending though, really shows how Dark can differ from the standard Justice League. While "black ops" style teams are nothing new, good guys that do the dirty work that the prissy heroes wouldn't dream of, this is another thing entirely. The supernatural aspect gives the book a little schizophrenia as well. Some of the ideas are down right horrific, yet it still has that action "hero" book feel to it were consequences are nearly irrelevant. Is this is a horror or an action mag? I think at this stage the people making it do not even know themselves, or probably in actuality the writers know, but that may be a bit different to what the guys in suits were told when they set it in motion. Nothing is what it seams, let alone motivation or meaning. There is some extremely fertile ground here for some really awesome stories and while I think this was a very rocky start there is a spark here that could very well develop into something very, very readable. Ultimately its reliance on the "Justice League" analogue could be its downfall. I expect the team members to stay in flux for a while. Shade and Mindwarp are prime to be replaced, and probably shouldn't have been in the mix to begin with. It would have made the start of the story so much better if it didn't need to introduce and integrate them into the plot. Still, I have a good feeling about this.... and will be reading more..... . Besides.. Constantine is in it.